Extend the reach of your existing App investment. Develop new Apps rapidly & cost efficiently. 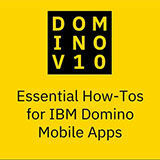 Watch the webinar, titled Essential How-Tos for IBM Domino Mobile Apps and learn how to create mobile solutions from your Domino applications. It will offer the inside scoop on how easy it is to extend the value of your proven applications to your “road warriors” and executives. In the time it takes to watch the webcast, you could have your first application up and running on an iPad. – Extend the reach of your existing App investment. Develop new Apps rapidly & cost efficiently. Domino V10 will turbo-charge your existing investments, and make it easy to keep on reaping the benefits with new skills and capabilities.